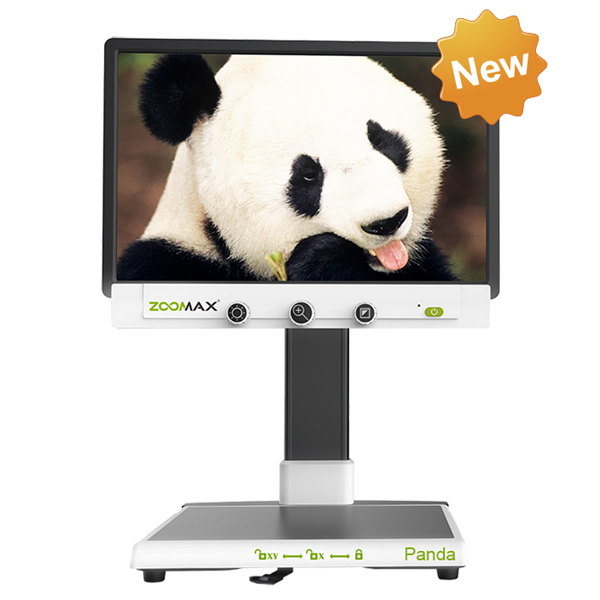 The Panda HD 19” desktop magnifier offers the advantages of a full desktop model in a compact design. With an HD camera and an HD screen, the Panda offers crystal-clear image quality at any magnification level. Magnification is adjustable from 2x to 70x, and with 17 high contrast color modes to choose from, you can be sure to find the combination that works best for you. Once you’ve found it, your settings can be saved so you can use them again next time. The Panda HD offers plenty of clearance between the camera and reading table, making it easy not only to read books, magazines and other print materials but also to do write, pay bills and do hobbies such as sewing or puzzles. With large, simple controls and an adjustable monitor, the Panda HD is designed to be easy and comfortable for users of any skill level. Zoomax Panda HD – the most affordable HD desktop CCTV solution. * Net Weight: 39.7 lbs.